Yet here I am now, with a teenager in the house. And I find myself in a frustrating but familiar pattern. The cell phone we just bought sits shattered and dented on the kitchen table after a skateboarding incident, the protective case gone. I see the opportunity and surge into lecture-mode. And just like that, I’ve let a broken cell phone cause me to wonder where I went wrong. I let my self-doubt bring me to a harsh conclusion. I’ve failed at teaching my child how to be thankful. ​In Psalm 79, a psalm of Asaph, God’s people are crying out to the Lord in distress. They’ve made mistakes, and other nations have come against them with great force. While confessing their sins of the past to their Heavenly Father, they also ask for deliverance. “Help us, O God of our salvation, for the glory of your name; deliver us, and atone for our sins, for your name’s sake!” (79:9). But as their plea comes to a close, they commit to a life of thankfulness – not only for themselves, but for generations to come. Their children. Like the Israelites in this passage, we want our children to be thankful. 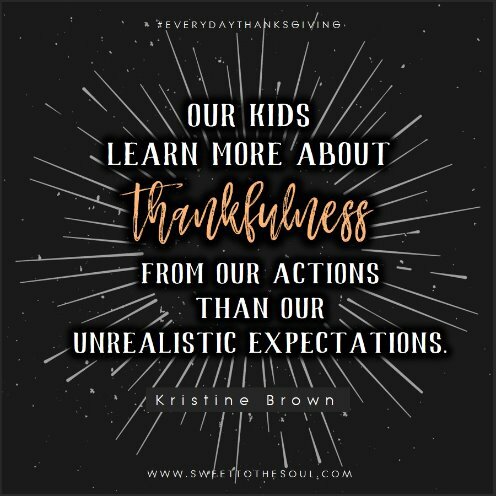 But when they go through that tough transition from childhood to teenage independence, how do we let go of the lectures and teach true thankfulness? My kid would be someone who always put others first, no matter what the cost. He would sell his belongings, give to the poor, and probably grow up to be a missionary in a third-world country. However, in the midst of these high expectations, I realized an important truth. Everything we have comes from the Father. James 1:17 (ESV) tells us, “Every good gift and every perfect gift is from above, coming down from the Father of lights…” I know this to be true, but do I demonstrate it with my actions? Or do I constantly complain about my circumstances? 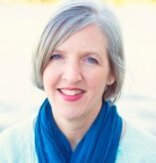 I can’t expect my child to understand true thankfulness if he hears me grumbling. When I’m running late for work. When another medical bill shows up in the mail. When I’m tired, aggravated, or ready to give up and negative words fly out of my mouth, God speaks this gentle reminder to my heart. Why can’t you be grateful for what you have? Just as a loving parent wants his child to be thankful for their good and perfect gifts, God desires our thankfulness as well. And when we live daily in an attitude of praise, our children learn true thankfulness. Not from lectures, but from our living example. Let’s commit to living a thankful life today. What an impact we can have on our families and loved ones through glorifying the Father of lights! 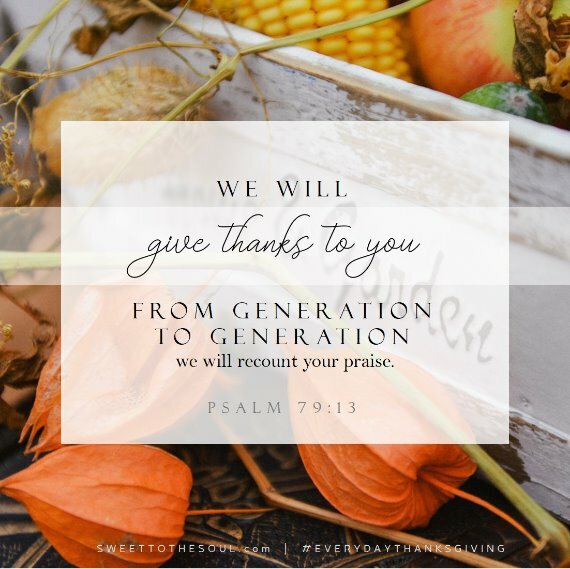 We will leave a legacy of gratefulness to God for generations to come. "when we live daily in an attitude of praise, our children learn true thankfulness. Not from lectures, but from our living example." Wow, powerful, Kristine! Thank you for sharing so vulnerably. I've heard many times "more is caught than taught". This is a good reminder of that truth. Thank you Kristine for sharing! what a good word and reminder! thank you! Thank you Kristine for sharing with us this real live mothering moment. Such a strong lesson here! Blessings sweet friend. Well said. I've been right there...shattered phone and a lecture, another bill and I whine. Well said to this mommas heart...hopefully I can practice what I read. Amen to this, Kristine. It can be so hard to let up on our kids and let them be kids. Yes! They learn more about thankfulness from our actions and attitudes than from unrealistic expectations. Totally true. Those little mirrors! They reveal so much about us and it's so good for us. Taking these words with me today as we've been on a run of *all things breaking* around here. Grateful for you and your always on point words. Very well written! I see myself in this. Thank you!